Low Floor buses were first introduced in 2009 - as part of JnNURM funding. The basic intention of these buses were to modernise city transportation in the cities of Kochi and Trivandrum, where they were launched. 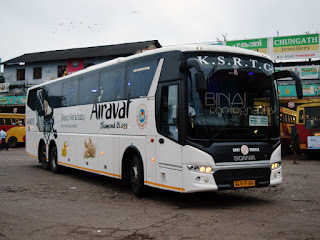 Operations of these buses were handled by KSRTC, who felt they made losses in city routes and put them on longer intercity routes. While the passenger response in these routes were good, the basic purpose wasn't served. 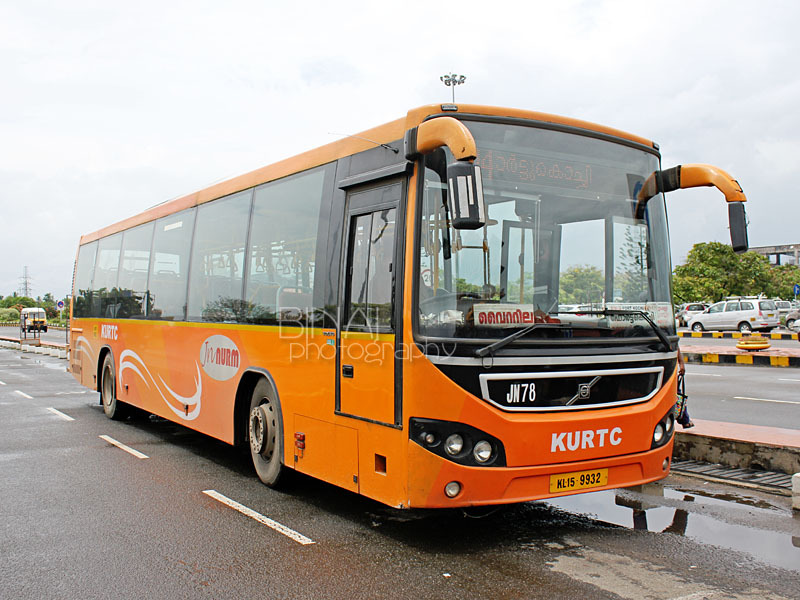 This led to some legal issues finally leading to the High court of Kerala issuing orders restraining KSRTC from operating such buses beyond the project area. Considering the fact that urbanisation in Kerala is widespread and not confined to certain areas, the Kerala government divided Kerala into clusters of 2-3 districts and received funding for clusters than cities. A new subsidiary was formed under KSRTC, called Kerala Urban Road Transport Corporation (KURTC) to handle JnNURM buses. With JnNURM-2 funding, there are Volvo services across the state now. Low floor Volvo buses operate on intercity routes now, connecting one cluster to another. Traveling has become all the more comfortable with the advent of these buses. It is a different fact that the buses are a complete misfit to most of the routes that they operate on - the buses aren't comfortable for the routes they operate, and the higher operating costs translate to higher ticket fares as well. One of the newer Volvos in Kerala.. 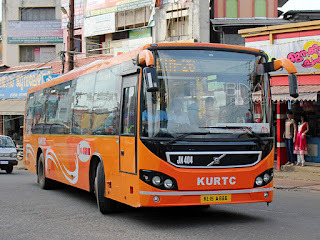 In one of my recent trips to Kerala, I had the chance to travel a lot in the newer Volvos that were purchased under JnNURM-2. The newer buses have a more lavish seating compared to the older ones - the number of seats are down to 31 from 38, as well. The newer buses have a high back seat as well - offering a more comfortable ride to passengers. 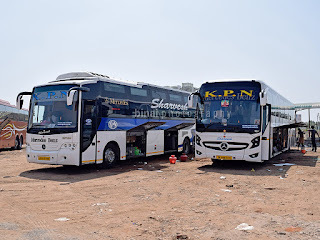 I had the opportunity to travel in one such bus (JN361 of Alappuzha depot) from Vyttila to Alappuzha - the improved leg room and the comfortable back rest makes for a very comfortable journey. The bus took close to about 90 minutes to complete the journey, since it was a normal shuttle service and had too many stops on the way. Given the comfort the bus offered, I was particular about traveling in a Low Floor bus for my return journey as well. I was to head to the airport to catch a 1605hrs flight back to Bangalore (read the flight review here). My parents would be traveling along me till Ernakulam. We left my maternal home at sometime around 1000hrs. We were at Alappuzha bus station by around 1050hrs. 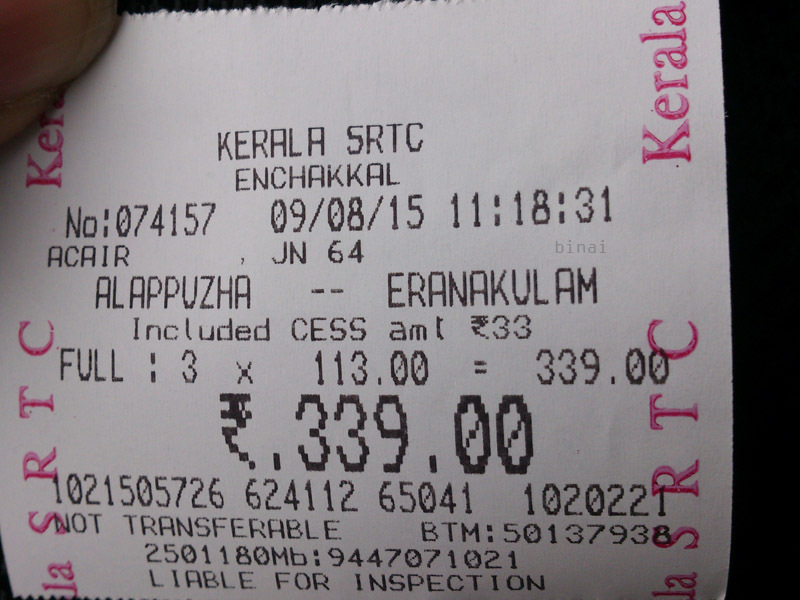 On enquiry, I was told that the next Volvo to Ernakulam was at 1110hrs - that was acceptable. My parents approved the plan to wait till that bus comes. Since that bus is inbound from Trivandrum, I had a small fear that it could be crowded and getting a seat might be tricky. I remained around the entrance of the bus station, so that I'd have prior information about the arrival of the bus and we have a better chance of getting a seat. 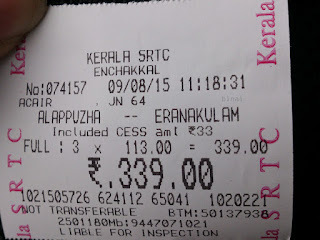 Sometime past 1110hrs, JN64 of Enchakkal Depot (Trivandrum) pulled into the bus station. The bus was registered in April 2012 - a 3 year old bus. I had to attack the door as soon as it opens, in order to grab seats. The doors opened, people walked out, and I succeeded in grabbing three seats - 2 for my parents, and 1 a little bit behind for me. The bus left Alappuzha at 1115hrs. The bus showed its age - rattling sounds were apparent from the rear axle. The engine sounded calm, though. All seats were taken when we left Alappuzha bus station. We crawled for sometime on the highway. Some melodious songs were being played on the entertainment system. The driver let the beast loose after some time. The bus went into Cherthala bus station (1145hrs). The bus remained full throughout. We left Cherthala at 1148 - it was bliss after we entered the 4-lane roads after Cherthala. I was dropped at Vyttila junction at 1231hrs - my parents continued in the same bus to MG Road. While the AC made the ride comfortable, the stiff seating position made the ride painful. I had a stiff back by the time I got off at Vyttila. The ticket fare was Rs. 113 per head. The legroom was poor, and the seating position was poor as well. The end-to-end ride took an hour and 16 minutes - and we made just 2-3 stops on the way. 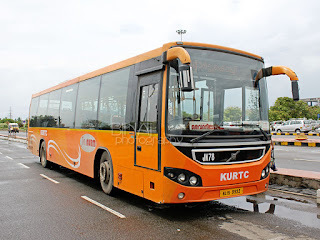 These low floor buses are certainly a great way to commute short distance - I am not sure if one might be able to travel long distance in these comfortably. 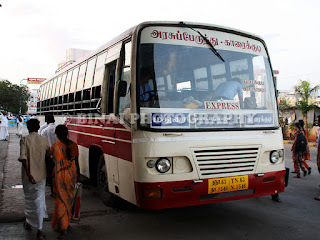 I took another low floor Volvo from Vyttila (JN78) to reach the airport - this bus was packed to the core. Had to travel standing till Edappally, where I got a seat. I was at the airport by 1345hrs - long time before my flight back to Bangalore! 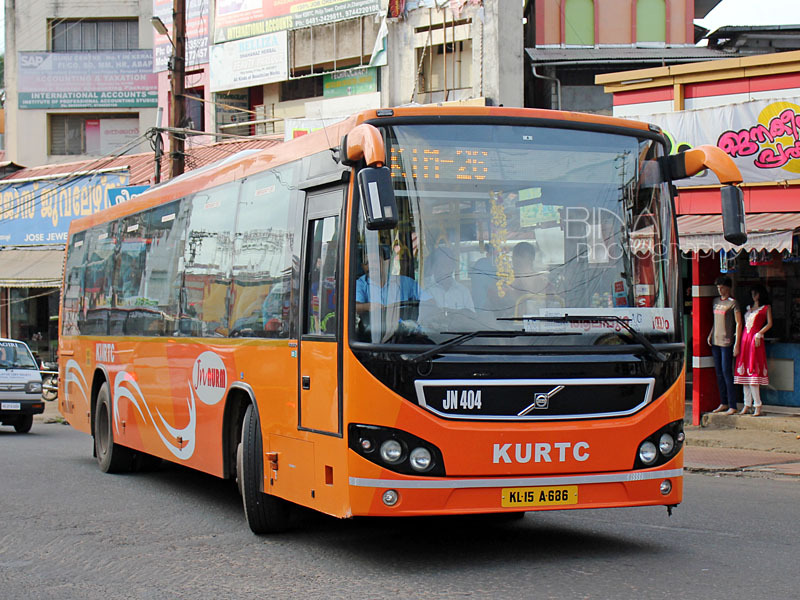 Kerala presently has about 190 Volvo Low Floor buses (not all of them are commissioned yet). 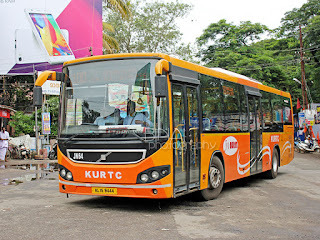 Short intercity shuttles are a great choice of routes for these buses - but KSRTC/KURTC is taking it a bit too far with longer routes. They are too uncomfortable for long travel. I hope they realise the mistake and concentrate on higher frequencies on shorter routes.